Whoopee Booties, Sears catalog, Fall 1929, p. 63. They came in red with gray or black with red trim. Last week The Vintage Traveler reminded me that shoe illustrations, being fashion illustrations, are not always truthful. 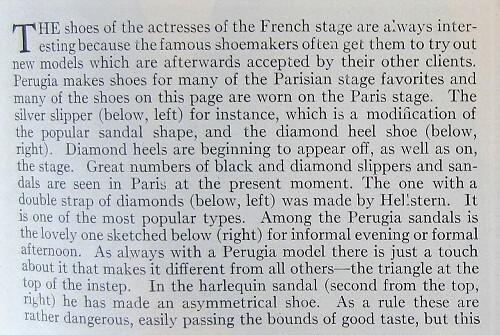 As a vintage buyer and dealer, she observed that real 1920’s shoes generally do not have super-high heels. That sent me to the ever-useful Sears Roebuck catalogs at Ancestry.com. 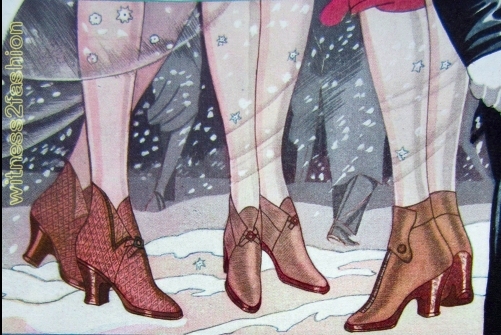 And that is where I was distracted by these “Whoopee Booties” from 1929. Sears Whoopee Booties, 1929. “Modern as youth itself!” Do they lace all the way up, or do they “flap?” Rain boots from 1928 looked like this. And before discussing heel height, I want to recommend one of the best articles on “Flappers” that I’ve ever seen; the Silent Film site Silent-ology devoted the month of March 2018 to Flappers and wrote this brilliant essay to set the theme. Click here for The History (and Mythology) of 1920s Flapper Culture. Women from the twenties (like my mother and my aunt) were proud of having small feet (or, more precisely, of wearing small shoe sizes, which is not quite the same thing….) It’s interesting that in 1929 “smaller feet,” not “longer legs,” was the selling point for higher heels. But, as The Vintage Traveler predicted, in most of these ads showing high heels, the heel height — even when described as “spike heels” — is two and a half inches. Two and a half inch “spike heels.” Sears catalog, Fall 1929, page 67. These pumps were available in black satin (for evening) or black patent leather. They have 2 1/2 inch “spike heels.” Notice the range of sizes. The Savoy style was “an actual copy of a high priced model” — and these heels were only 2 inches high. The Parisian shoe from Sears. Fall of 1929, p, 66. These are actually 2 inch heels. The heels of these green shoes are just 1 3/4 inches high, but they don’t aspire to be “spike” heels. Sears, Fall of 1929, p. 64. These surprisingly asymmetrical shoes have a delicate braided T strap which seems to un-braid on to the toe of the shoe. 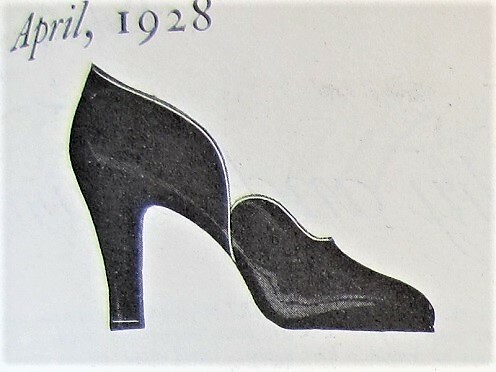 The 1928 article in Delineator remarked on the unusual asymmetrical style of a shoe by Perugia. These chic shoes also have a modest 2 1/2 inch spike heel. And, to return to those youthful Whoopee Booties, they have a 1 and 3/4 inch “military” heel. Whoopee Booties from Sears, 1929. They have 1 3/4 inch heels. Another victim is by her side. Detail: ad from Delineator, May 1929. “She sits alone most every night. He doesn’t phone or even write. You can see Eddie Cantor perform his 1928 stage hit song, “Makin’ Whoopee” in this movie clip from the 1930 color (!) film musical Whoopee! Co-produced by Florenz Ziegfeld (Jr.) and Samuel Goldwyn, this film is as close as I’ll ever get to seeing a Ziegfeld show — with musical numbers staged by Busby Berkeley. 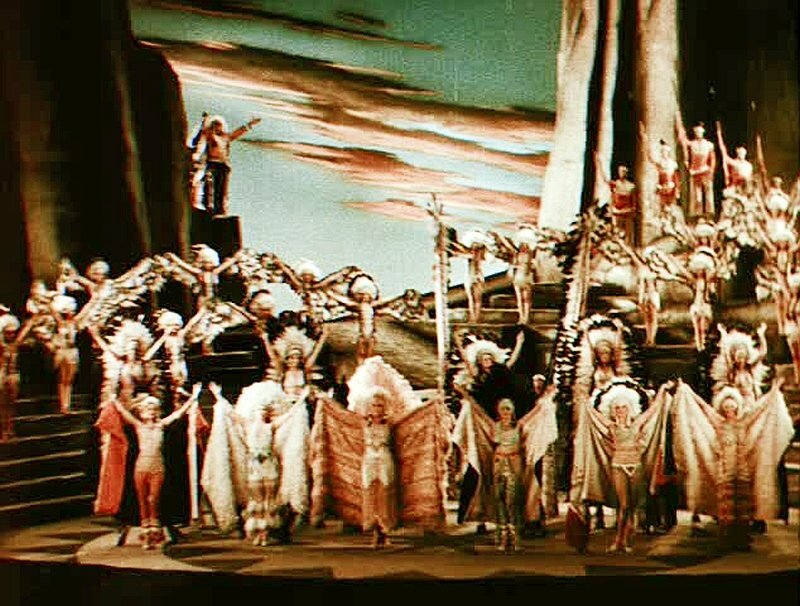 Set “out west,” the film quality is poor, the plot is silly, but the costumes are fabulous — if you can stand dozens of half-dressed women of European ancestry wearing enormous feather headdresses, and Eddie Cantor wearing blackface…. (truly nauseating.) If you’re designing a revival of Will Rogers Follies, it’s a must-watch bit of research. Besides, tap-dancing cowboys!